Learn all about Front Calendar. 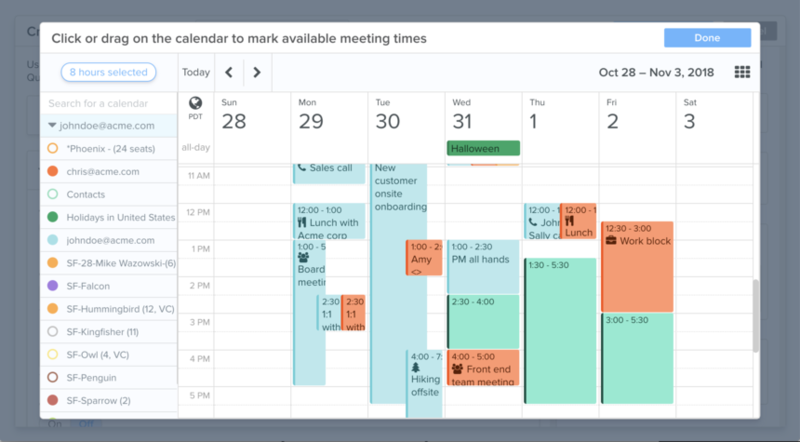 Scheduling links make scheduling meetings with anyone faster and easier. 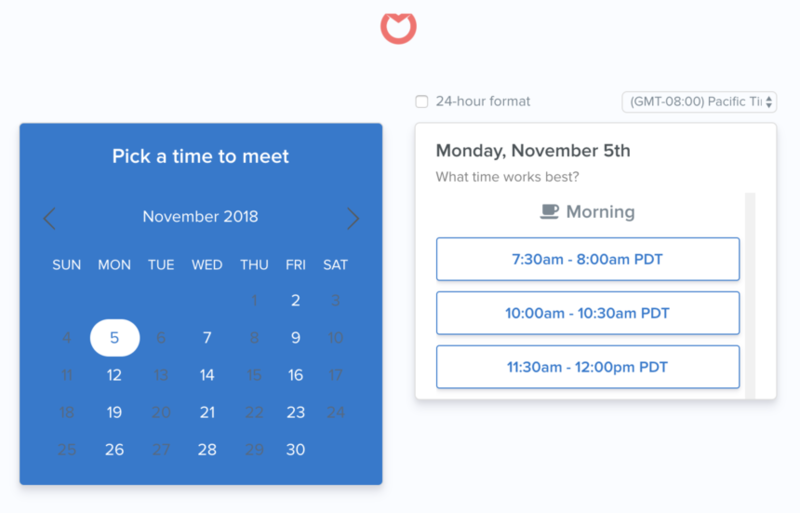 A scheduling link corresponds to a type of meeting you'd like to schedule, and you can create as many links as you'd like. Link 1: "Prospect Introduction Meetings"
If you haven't already, open the Calendar plugin and login with your Google or Office 365 account. After logging in, select "My Scheduling Links" and then "New Link". 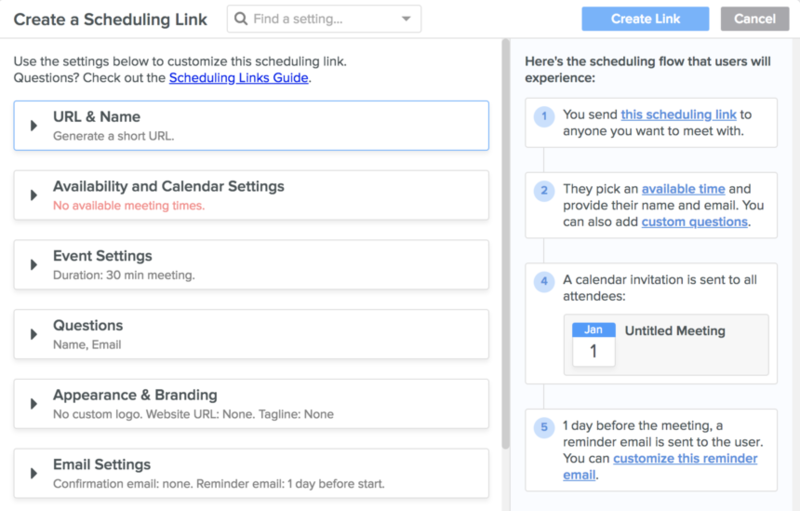 This will open the scheduling link creator, which consists of a list of settings for your link. Open the "URL & Name" section to select a URL type. You can choose between a short, auto-generated URL (e.g. app.frontapp.com/m/12345) or a customizable URL (e.g. app.frontapp.com/l/johndoe/coffee-chat) . Open the "Availability and Calendar Settings" section to set the times that users will be able to book. Use Non-recurring times if you have specific time and dates in mind like June 20th, 2pm-4pm and June 22nd, 10am-12pm. Use Recurring times if you want to have the same meeting availability week to week ("every Tuesday from 9am to 4pm"). From here, you can also select the calendar that meetings will be added to. To ensure you're not double-booked during any of these availability slots, make sure you select the appropriate calendars in the "Prevent Double Booking On" setting. By default, your default calendar will already be selected here, but you can also add or remove additional calendars to customize this behavior. Open the "Event Settings" section to customize the topic, duration, location and more of events schedule with this link. Open the "Email Settings" section to add optional customizable confirmation and reminder emails. The confirmation email is sent to users after they schedule a meeting with you. Whether or not you add a custom confirmation email, users will always receive a calendar invitation after scheduling a meeting with you. The reminder email is sent to attendees in advance of the meeting to prevent no-shows. Once you're happy with the settings you've chosen, click "Create Link" and then copy it's link to share it. You can always change the link's settings from the "My Scheduling Links" section. Welcome to the Front Help Center! Whether you're new to Front or you've been with us for years, this is your place to learn about Front, access our training resources, and get support from our team. If you need assistance, please don't hesitate to email us at team@frontapp.com. Welcome to the Front community! The Front community is your place to come together and discuss the product, register for webinars, and get support from our help center. New to Front or need to refresh your skills? Join us for live training sessions every week! Check them all out here. If at any point you need assistance, please don't hesitate to email us: team@frontapp.com.